Registration for the Great People Inside Conference: “The New World of Work” – the only international event held in Romania for 14 consecutive years – has started! We are currently at the beginning of the 4th industrial revolution. Professional transformations are set in motion by globalisation and technological revolutions, especially a digital revolution – going from mechanical technology towards digital technology. The speed at which these changes are occurring is not going to slow down – in the next 20 years we will witness a continuous revolution of the workplace and workforce, marked by volatility, uncertainty and complexity. 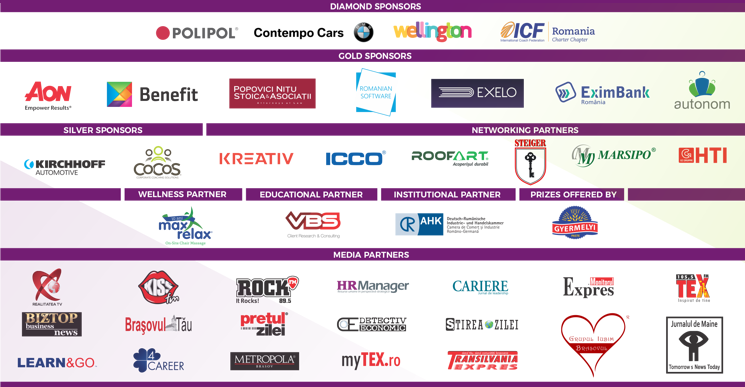 The Great People Inside Conference: HR (R)Evolution, which will take place on 11&12 Octomber 2017 at Kronwell Hotel, Brasov, Romania, will launch into interesting and challenging discussions regarding the pace of technological changes being made, the effects it has on jobs and the implications it has on HR, organisations, and employees. A unique concept bringing together business representatives, entrepreneurs, managers, specialists and researchers in the field of human resources from all industries; psychologists, representatives of central and local authorities, large consulting companies, as well as internationally renowned experts from the United States of America, Canada, Czech Republic, Italy, Spain and Germany. The 2-day programme combines thematic presentations, bold conversations and group discussions in an interesting manner, with the purpose of discovering techniques and strategies that will determine success in the near future, eliminating the uncertainty of this transitional moment and preparing for the rapid changes that occur in the workforce. An event dedicated to sharing ideas, inspiration and information regarding the future of work. For more information, please visit the conference’s dedicated website. In our present times, there is an increasingly high interest for investment in HR technology. According to a study done by CB Insights, in 2016, there have been over $1.96 billion invested in start-ups that exclusively dealt with HR tech. Workplaces around the world are continuously changing due to technology. The tech revolving around HR is there to automate and streamline practices in order for the department and company to become the definition of efficiency, high performance and cost-effectiveness. The biggest challenges for HR stem from recruiting and hiring, thus, applications have come to life in order to save the employer and employee’s lives. In today’s competitive job market, around 75% of CV’s are being screened out. Furthermore, the HR department loses numerous hours on resumes from unqualified people. Losing so much precious time represents one of the biggest challenges for HR. This is one area where technology may solve the problem. Artificial intelligence (AI) is on the front foot in regards to developing specific HR tech. Recruiting and AI fit perfectly together due to the simple fact that AI demands huge amounts of data and multi-national companies have resumes by the millions in their databases. Going through such a large database is exhausting for a person, but with the help of AI the process of screening can be done rapidly and offer a compelling list of candidates based on job requirements by means of simply grading them from best to worst. By using AI for the screening process, you might save the company up to 75% of screening costs. The interest in automating the recruiting process is continuously rising. On average, it takes 41 days for a company to fill in an available role in their ranks. On LinkedIn, there is a reported 11% rise in the volume of hirings this year; however, only 26% of recruiters have a positive headcount. Discovering top talent in today’s world is hard enough and recruiters require automation to intelligently pick their candidates. Automation can be helpful in many ways. Recruiters can automate their calendars and email to send requests to candidates that have been identified as good matches through the use of the AI screening tool, so recruiters don’t have to deal with B-list candidates. Virtual reality simulates the environment surrounding us which can be controlled through our body movements. In a survey organised by Universum, employees working at various companies believe that in the next 10 years VR will become an integral part of their workplace. VR will be of tremendous help with testing and training. Recruiters can use this technology in order to assess a candidate’s skills and abilities. In a survey conducted by Korn Ferry, it has been discovered that 39% of employers deal with high employee turnover rates in the first year due to mismatch. VR could be massive for the HR industry, because it could help reduce turnover by providing candidates with a realistic view of what the job actually consists of and get to understand the company culture as well. The medical industry could greatly benefit from VR. Onboarding and training could be completed by residents in the trauma and emergency sections of the hospital, where the stakes are always high. As mentioned in a previous article, one of the biggest HR trends from 2017 is employee engagement. In order to nurture it in employees, employers have started tracking their behaviours so that they can interact and communicate better at work. For example, at Microsoft, there are digital employee badges that monitor employees’ movements, who they spend their time with at and many more. This type of tech collects data which is processed and then given to employers in order to understand their coworkers and how they communicate, how to better optimise the office space and manage the dynamics of the team. This could potentially lead to a better organisation and collaboration within the company. There are also rumours that in the not so distant future, wearable technology could lead to insights in emotions and personality during screening or interviewing.